Gingivitis is an inflammatory process limited to the mucosal epithelial tissue surrounding the cervical portion of the teeth and the alveolar processes. 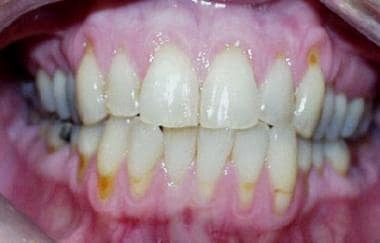 Gingivitis has been classified by clinical appearance (eg, ulcerative, hemorrhagic, necrotizing, purulent), etiology (eg, drug-induced, hormonal, nutritional, infectious, plaque-induced), and duration (acute, chronic). The most common type of gingivitis is a chronic form induced by plaque. Gingivitis is shown in the image below. Compare the image above to a healthy mouth, below. Acute necrotizing ulcerative gingivitis (ANUG, ie, trench mouth) is an acute infectious gingivitis. The term trench mouth was coined in World War I when ANUG was common among trench-bound soldiers. 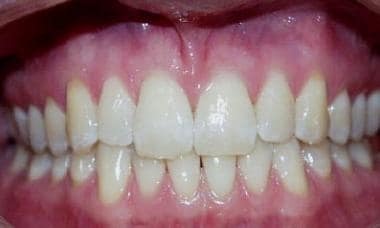 The most common type of gingivitis involves the marginal gingiva and is brought on by the accumulation of microbial plaques in persons with inadequate oral hygiene. Gingivitis proceeds through an initial stage to produce early lesions, which then progress to advanced disease. The initial stage of an acute exudative inflammatory response begins within 4 or 5 days of plaque accumulation. Both gingival fluid and transmigration of neutrophils increase. Deposition of fibrin and destruction of collagen can be noted in the initial stage. At approximately 1 week, transition to early lesions is marked by the change to predominately lymphocytic infiltrates. Monocytes and plasma cells also may be present. With time, lesions become chronic and are characterized by the presence of plasma cells and B lymphocytes. As chronic local inflammation progresses, pockets develop where the gingiva separates from the tooth. These pockets deepen and may bleed during tooth brushing, flossing, and even normal chewing. As this persistent inflammation continues, periodontal ligaments break down and destruction of the local alveolar bone occurs. Teeth loosen and eventually fall out. ANUG is a completely different syndrome caused by acute infection of the gingiva with organisms such as Prevotella intermedia, alpha-hemolytic streptococci, Actinomyces species, or any of a number of different oral spirochetes. ANUG may result in accelerated destruction of affected tissues, as well as local or systemic spread of infection. Noma (cancrum oris) is a syndrome in which ANUG spreads beyond the gingiva. The infection invades local tissues of the mouth and face. ANUG may be a clinical problem in immunocompromised patients during chemotherapy. Gingivitis and resulting periodontal disease are seen more frequently in patients with either diabetes or HIV. Severe periodontal disease, as shown in the image below, may occur. 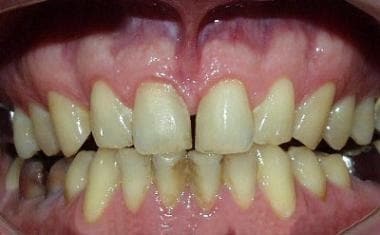 Chronic gingivitis leads to tooth loss. ANUG may progress into the local soft tissues of the mouth, resulting in noma or cancrum oris, or may spread hematogenously to any other part of the body. Gingivitis is slightly more prevalent in males than in females because females tend to have better oral hygiene. Adults are most commonly affected. Children from sub-Saharan regions of Africa may be at risk for ANUG because of poor living conditions.